8.6.1.1 Why not using 'delete/3' ? 8.6.1.2 Why not using 'select/3' ? 8.6.1.3 Why not a step with less rules ? IN CHAPTER we have explained that we will construct an adaptor based on three requirements. Every requirement will be satisfied by one module. The enforce-action module will allow the adaptor to satisfy the no-conflict requirement. To this end, this module will bypass a provided concurrency interface by means of a logic deduction. Therefore a reachability analysis of the Petri-net description of the provided concurrency interface will be used. In this chapter, after presenting standard techniques to do such an analysis, we will explain how we will perform a reachability analysis by means of prolog. A REQUIREMENT FOR THE MODULE we will develop is that it should be able to receive any possible action from the logic interface and execute it on a server component. To do so the necessary synchronization messages should be generated automatically. The adaptor itself has 3 ports (see picture 8.1). One port is connected to the concurrency module and provides/requires a logic interface. Another port is connected to the server-component and provides/requires a logic interface and a last port, providing/requiring a synchronization interface also connected to the server component. In essence, there are two completely different techniques which we can use to shortcut the concurrency strategy. The first is the use of an on-line learning algorithm, which is suitable in this case because the learning algorithm can keep on trying to enable a certain action until it is successful. In the meantime the concurrency adaptor can be set to wait. The reward given here is straightforward and defined by the enabling of the required transition. The second approach uses inductive reasoning to deduce what kind of actions should be taken in a certain context. This is the approach we will investigate in more detail because it has a faster response and works in most situations. DEDUCING HOW WE CAN ENABLE a certain state within a petri-net, given its current marking seems typically a problem of reachability, however there are some differences. A reachability analysis of a Petri-net indicates whether we can reach a certain marking or not, often information is included how this marking can be reached. In our case we don't want to reach a specific marking, we only want to know how to enable a transition as a result of a certain marking. Formally, we want to find a way how to reach from . If the petri-net is symmetric then the reachability problem is EXPTIME-complete (see glossary). A petri-net is symmetric when for every transition there is a transition that undoes the effect of the first transition and returns to the original marking. This is a property which is often found in concurrency interfaces. Once a lock is obtained it is possible to release it again. However, aside from this intuition nothing guarantees that the petri-net also exhibits this behavior. If the petri-net is conflict-free and bounded then reachability is decidable in P. (see glossary) A Petri-net is bounded when there is a maximum number of possible tokens present at a certain place (see section 3.10). A Petri-net is conflict-free if for every possible marking the net is persistent. A petri-net is persistent if for every place with more than one enabled output transition, the execution of one transition does not disable the other transition. In the case of concurrency interfaces this is highly likely because normally multiple transitions will not be enabled at once and the amount of resources remains fixed. Reachability in timed petri-nets is NP-complete [LLPY97,BP96]). Our expression language is not a standard language so we don't exactly know whether all these properties hold with the given language. We assume they do, because the expression language used is a functional language which is not Turing complete and as we will experimentally observe most concurrency strategies can be written down as finite state machines. Colored petri-nets make all these formal approaches a bit problematic. Expanding a colored Petri-net to a simple Petri-net may require an infinite explosion, so all these decidability criteria need to be investigated again. There are a number of algorithms available to decide whether a marking is reachable from an initial marking . Below we will briefly summarize them and explain why they do not fit our needs. Reachability graphs: The reachability of marking from marking is often decided by creating a reachability-graph. Here the nodes of the graph contain a marking and the arcs contain the transition that brings one from marking a to marking b. Reachability is then decided by creating a matrix containing on the X/Y-axis all possible nodes/markings. The values within the matrix specify whether X is reachable from Y. With every step more positions are filled with 1, by taking the transitive closure of the reachability graph. This approach is formally very nice; a drawback however is that it takes too much time since often we only want to know whether A is reachable from B and not whether all possible A 's are reachable from all possible B 's. Unfolding Petri-nets: With this approach a Petri-net is unfolded into another Petri-net, usually with an infinite but simpler structure. McMillan [ERV96], proposed an algorithm for the construction of a finite initial prefix of the Petri-net, which contains full reachability information. However, this information is difficult to generate, and can take a long time. Therefore we didn't investigate this track further. Exploiting symmetry: It is possible to exploit symmetry between states by only looking at one side of the symmetry. This is especially useful for colored Petri-nets. Intuitively: within a dining philosopher Petri-net, there is a 4 way symmetry. There is no need in trying out every philosopher, which reduces the state explosion drastically. How this is done in practice is described in detail in [Jør]. Aside from all these techniques, there is a property of our problem which might also be exploited. In our case, we have the ability to search for a specific solution. As stated earlier, we want to know how to get from a certain marking to another certain marking , that enables transition . It is important that we are not even looking for the shortest path, but simply need to find one way to enable . Now, let us turn back our attention to Petri-nets. As explained in section 3.4.4, it is difficult to create a high performance Petri-net evaluator for colored Petri-nets because a transition is enabled if a suitable combination of input tokens exist. This is typically a search problem and we have argued that a logic engine (such as prolog) might be a suitable language to write a Petri-net evaluator in. Given the fact that most reachability analysis work for elementary Petri-nets, but have often difficulties understanding the possible expressions present in colored Petri-nets, it seems appropriate to use prolog as a logic engine to do a reachability analysis. This is what we will describe below. BEFORE WE CAN DEDUCE certain interesting properties from a Petri-net we need some representation of Petri-nets within prolog. We will now explain how we can convert Petri-nets to prolog rules. But before we do so, we will explain how we define our markings. Markings are declared by a set of simple rules as shown in algorithm 18. A marking is represented as an association list of place-names and place-content. The content of a place is a list of tokens. 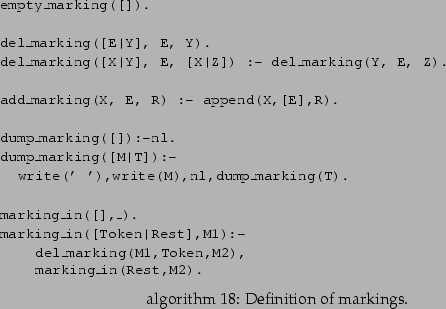 The basic operations on markings are del_marking(input_marking, to_delete, output_marking) and add_marking(input_marking, to_add, output_marking). 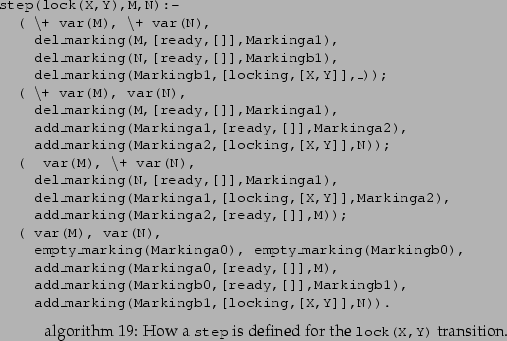 del_marking will remove a token from an input marking and create an output marking. add_marking will add a token to a given marking. Markings can be either relative or absolute. A marking is relative if it only mentions the necessary tokens without including all possible other tokens that could also be present. A marking is absolute if all the tokens that are available are specified in the marking. The notion of a relative and absolute marking is necessary to be able to deduce which tokens should be present in a certain marking without actually having a real marking at hand. Without the notion of a relative marking the process of finding out how to reach a certain sub-marking might take a long time because the step predicates would try out all possible permutations within the offered absolute marking. A relative marking is well defined because Petri-nets do not allow an absence check of tokens, so we do not need to specify which tokens cannot be in a certain marking. The convention we will use is that step(T,M,N) declares a valid transition which brings marking to marking . E.g., step(lock(X,Y),,N) will find all possible resulting markings N after executing the lock(X,Y) transition. This is illustrated in algorithm 19. Depending on whether M, N or T are known the behavior is different. If both and are known, the predicate step(T,M,N) will check whether is a valid transition between M and N. This is done by verifying the presence of all input tokens in M and the presence of all required output tokens in N.
If only is known, will match the resulting output. If multiple token-pulls are possible from M, multiple answers will be placed in . If only is known, will match the necessary input for T to result in N. If multiple possible inputs are possible they will all match. If neither nor is known, The transition will create a relative marking and . transition: declares whether something is a transition. place: declares whether something is a place. action: an action is a message that can be received or sent over a logic interface. These are return_joinactor(_), set_position(_,_,_), return_set_position, isfree(_,_), return_free_true and return_free_false. synchro: a synchronization message. Every transition that is not an action is considered to be a synchronization transition. incoming: a transition is an incoming transition if it is received from some external source. We have no choice but to accept incoming transitions and we cannot fire them ourselves. outgoing: a transition is an outgoing transition if it is the result of another incoming transition. Incoming and outgoing declares the two directions in which a message can go. where the two free variables X and Y can be filled in when appropriate. This fact allows us to reason about a colored Petri-net in an abstract way. This is a huge performance-improvement because, we can now easily check how we can enable SetPosition(12,13) without actually having a marking at hand. Therefore we need to check out how we can enable SetPosition(X,Y) and try to match the resulting relative marking, which will contain a token such as locked(_,_). This allows for the creation of an abstract description how to enable the SetPosition token, something which would be very difficult with a completely expanded Petri-net. If we continue this line of thought we can easily see how we can enumerate all possible future traces given a certain depth and initial marking. Algorithm 20 shows how this can be done. The fwd_step rule will expand a marking into all possible futures. The fwd_steps takes a list of nodes, which can be either expanded or unknown. Unknown nodes are expanded one step further when executing fwd_steps. Expanded nodes are simply followed. With this we can construct a tree that can be expanded a bit further every time. With this rule-set we can easily track down how we can enable a certain transition, or reach a certain marking. All we have to do is check whether the transition we want to enable (or the marking we want to reach) is present in one of the possible futures. If it isn't we can go one step deeper. A small problem remains to be explained here. When finding out how we can go from to we can only investigate synchronization actions. For example, it should not be possible for such a trace to contain a joinActor message because the adaptor cannot choose to send out its message since it is part of the interface. This states very simply that, given the start situation, we can choose to execute lock(_,_) or return_unlock_false. It is clear that only the first one is under control of the client, because a return_unlock_false must be issued by the server. The possible tracks from there on are either again to lock or to receive a lock_false, lock_true or return_unlock_false. Given a Petri-net and a marking we can also, in a similar way, deduce which actions could have led to this marking. This is illustrated in algorithm 22 and is similar to algorithm 20. 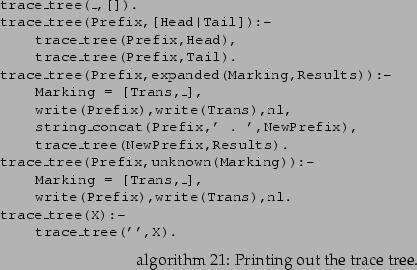 TYPICALLY, SEARCH ALGORITHMS, such as implemented in the forward or backward tracer, behave exponentially because the search tree expands exponentially. If the search algorithm looks at depth , it will take approximately time to find a solution, with being a constant. So, if we can reduce the search depth by halve we can find a solution times faster. With the ability to trace into the future and into the past we can find a solution to the reachability problem faster. The only thing we need to do therefore is going forward (from ) and backward (from ) at the same time. When a common marking exists between both traces, then we have found a possible path. 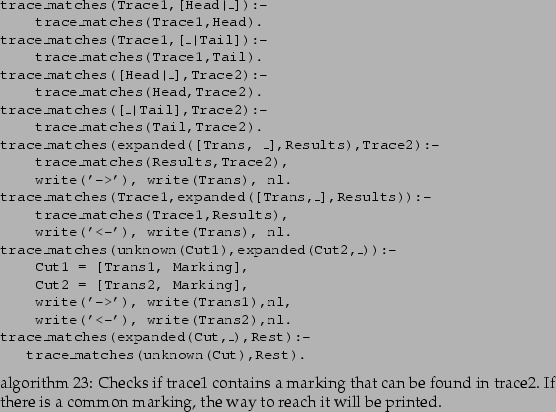 Algorithm 23 illustrates how we can check if two traces matches. Algorithm 24 will determine the different strategies possible to go from to . 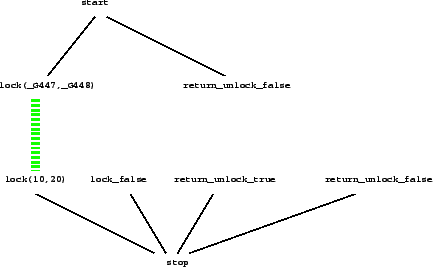 Figure 8.2: The trace-tree to reach a marking that bring position in locking. To illustrate the power of these rules, we will find out how we can enable position on a whiteboard, given an initial marking. 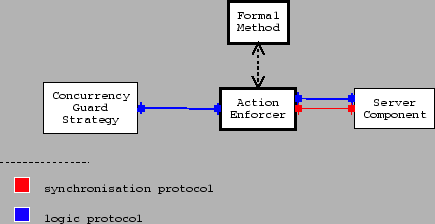 Figure 8.2 illustrates how the process works. On one track we have a forward reasoning (the top of the figure). This process determines that a possible future from the initial marking is lock(_,_). A second future is the possibility that a return_unlock_false comes back. However, this event cannot be controlled by the client because it is an incoming event, thus we ignore this possibility. The second process is a backward trace (the bottom half of the drawing), which correctly deduces that in the past a lock(10,20) could have been present, or a return_unlock_false, return_unlock_true or a lock_false. The process of finding a matching trace stops here because the marking at lock(_X,_Y) can be unified with the marking at lock(10,20). THE PRESENTED ALGORITHM has been tested with all the conflicts presented in chapter 6. However, because the prolog code was not integrated within Java, we had to test the code off-line. Therefore we obtained a start-marking from the Petri-net by exporting one from the Petri-net evaluator. After importing it into the prolog program, we asked the reachability program to enable a certain transition. In all cases the result was calculated immediately (no human observable time delay on a standard Intel processor). To a certain extent this is normal because most interfaces provide a certain functionality and are supposed to make state-changes easy and not difficult. An API which requires less messages to change a state than another API is clearly easier to use. Now, the reachability analysis is calculated immediately, nevertheless it took some doings before we were able to come up with such a result. Prolog is a declarative language and is perfectly suited to find ways to prove statements. Every solution of such a prove is a way to reach a certain marking. Nevertheless, how the evaluator 'proves' a reachability statement can greatly affect the performance of finding solutions. This has forced us to insert our a) own delete operation, b) to make a distinction between delete and append, and c) split the step predicate into 4 parts depending on which variables are bound. We now explain the details. By relying on our del_marking predicate we are sure that all tokens present at a certain place will be tried to satisfy the precondition of a transition. If we used the standard delete predicate this was not possible. select(X, [X | L], L). select(X, [Y | L], [Y | R]) :- select(X, L, R). Because the lists we are using represent tokens present at certain places the order of elements is of no importance. However, if we use something like select/3 we would receive the same tokens at least two times. (To be exact, we receive the same tokens times, with the number of elements in the target list). Because our search algorithm is constantly adding and deleting elements from markings, the search time would increase drastically. For every add_marking we would create at least two new branches. On the other hand, if we simply use the append/3 operation, we avoid the introduction of useless branches in the search tree. if both the input and output marking are bound then we must simply verify whether the necessary tokens are present. We can do this by removing the elements from involved markings. if only the input marking is known, we must first remove the necessary tokens from the input marking and afterward we can put the appropriate tokens in the output marking. if only the output marking is known, we must first remove the necessary tokens from the output marking and then we can deduce which tokens should have been present in the input marking and put them there. As can be seen, the order in which the tokens are investigated is important and different. This order is not strictly necessary, however, it greatly increases the performance of one step. Finding out what kind of tokens we could append to the unbound marking and then verifying whether these tokens can be found in the bound marking can easily lead to an infinite list of similar answers. Every new possible unbound variable might always be bound to the same token later on. We consider it better to get rid, as fast as possible, of free variables by actually binding them to one of the available tokens and then creating the required tokens for the unbound marking. By doing so, we a) increase the speed of the reachability analysis and b) get rid of a possible infinite amount of answers. By implementing the step as we did, we do not break the declarative programming style. The step predicate can be used in any way necessary. For the user of step it behaves perfectly declarative. The only thing we did by introducing a verification of the boundedness of the variables is increasing performance. The concurrency module its responsibility is to bring the server component in a required state. More specifically, the required state is defined by the incoming message because every incoming message must be accepted by the server. To make sure that the server keeps behaving correct, we restricted the possibilities of the enforce-action module to only interleave new messages. However, one problem was not anticipated, certain concurrency strategies require the ability to bring a server and its resources back to an old state. These servers typically embody a rollback mechanism. To allow this kind of logic, the reachability program must be modified to allow the use of messages. It takes advantage of the colored Petri-net description. Instead of expanding a colored net to all its elementary places, the process works on a high level of abstraction by keeping variables as long as possible variable and unifying them only in the end. It takes advantage of the possibility to reason in an abstract way about a marking. It does not require a fully described marking, it suffices to work only with the smallest necessary sub-markings. This results in a distinct advantage over other methods because all the possibilities introduced by non-relevant tokens are removed. It reduces the search space drastically by doing a forward trace as well as a backward trace at the same time. With this information, we can, given a petri-net description, a current marking and a target marking, easily deduce which actions should be taken to either a) enable a certain transition or b) place a certain token at a certain place. This enables us to create an adaptor that effectively bypasses the concurrency interface at a component, because all incoming actions will always be executed, no matter what state the component is in.